POTOSI, BOLIVIA — I struggle along on my hands and knees as the oppressive heat pushes in on me, pausing every few meters to take measured breaths through my mask. Thick dust chokes the air and I am only too aware that it contains particles of silica, asbestos, and arsenic. My world is reduced to the cone of light in front of me, illuminated by the lamp on my hardhat. I have no concept of space or time, only the narrow tunnel I am struggling through. Moments later I emerge into a larger chamber with other moving lights and jump out of the way as two dusty figures push an ore cart past me on seemingly ancient rails. This may sound like some kind of reality theme park, but it's not. 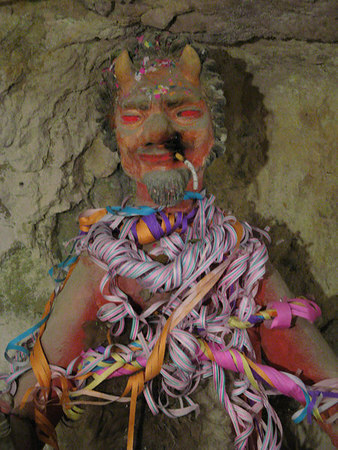 I am deep underground inside the infamous mines of Potosi. Sitting at an altitude of 4090m (13,400+ feet), Potosi, Bolivia, is generally considered to be the highest city in the world. Yet even with that superlative in its back pocket, Potosi is famous for something far more sinister: mines which have claimed millions of lives over almost five centuries. The city is dominated by the massive, pyramid-shaped Cerro Rico, literally "Rich Mountain," which serves as a constant reminder of the forces which have shaped its history. 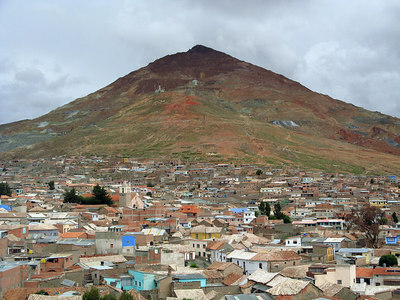 Pyramid-shaped Cerro Rico (4800 m, 15,800 ft.) dominates the city of Potosi. The discovery of large silver deposits under Cerro Rico in 1544 provided the impetus to found the city. At that time Bolivia was part of the Spanish empire, and the Spaniards were quick to exploit the resource. Between 1545 and 1824 up to 45,000 tons of silver were extracted from the mountain, rapidly making Potosi one of the most important cities in the world, with a population surpassing London or Paris. The silver produced here almost single-handedly funded the expansion of the Spanish empire for close to 200 years. The dark side of history tells a different story. It is estimated that over the past five centuries millions of people, the vast majority indigenous and African slaves, have died working in the mines. It is no accident that Cerro Rico has been nicknamed "The Mountain that Eats Men." I have decided that the best way to understand the mines is to experience them in person. My guide, Juan, is only too happy to share the gory details of history with me. "This mountain is like Swiss cheese," he tells me. "Miners have been digging tunnels here for hundreds of years and nobody knows where they all are. The whole mountain is being hollowed out; we're on borrowed time." Juan is a short, solid-looking man in his late 30's, and he knows a lot about Cerro Rico. He should; as a former miner he spent several years working underground alongside many of the same miners I will meet today. 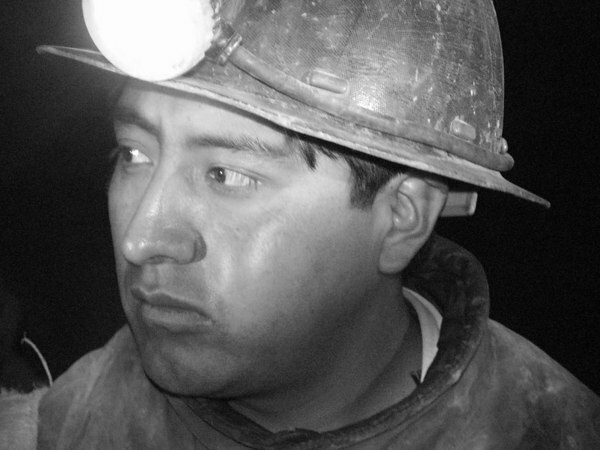 During his mining days he earned the nickname "Ocho," which he tells me means spicy in the local Quechua language, apparently some reflection of his personality. Our first stop after donning mining attire is the miners' market. This is where Potosi's miners come to shop, and you can buy everything from dynamite to pure alcohol with the same casualness that most of us would associate with buying a box of Oreo cookies. 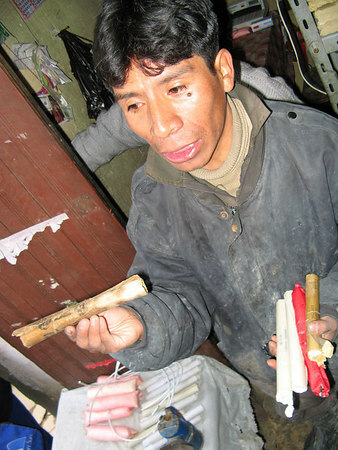 We step into a small shop and Juan launches into a lesson on explosives. I don't see the point in asking what makes one nation's dynamite better than another; I'm still shocked by the fact that I can walk in off the street and buy it, no questions asked. One complete explosive "kit," which includes a stick of dynamite, blasting cap, three-minute fuse, and a bag of ammonium nitrate fertilizer to enhance the explosion, costs a mere two U.S. dollars. 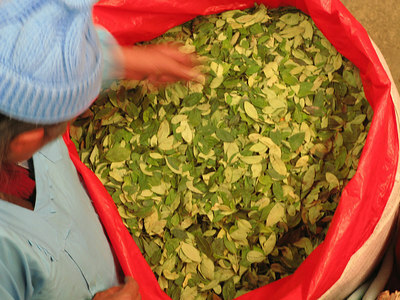 In addition to explosives we buy bottles of 96% pure alcohol (which the miners drink), bottles of soda, and bags of coca leaves. None of this is actually for us, but to give to the miners as gifts. It's a kind of 'thank you' for letting us crawl through their mine. Stocked with explosives, alcohol, and coca leaves, we head off to our next stop. It occurs to me that what I am carrying would probably land me ten years in prison back home. A few minutes later we pull up in front of an ore processing facility. It is surrounded by garbage – in fact, it looks like a dump – and as we approach I am hit with a strong chemical odor. 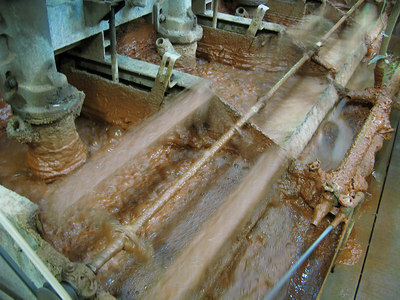 Ore processing employs many toxic substances including various acids as well as cyanide. Additionally, byproducts such as lead, mercury, cadmium, and arsenic are abundant. Yet from what I can see none of the workers are wearing any protective equipment. Entering the plant there are piles of semi-processed sludge sitting on a concrete slab by the door; who knows what it contains. Inside it is almost impossible to hear over the industrial machinery. Large tanks of frothy brown liquid are being stirred by enormous paddles, the contents separated into troughs. Juan reaches into one of the troughs with a small pan and lifts out a bit of the foamy brown soup. Like a prospector panning for gold he swirls it around while rinsing the contents with clean water. A minute or two later there are a few tiny flecks of pure silver resting at the bottom. A bit further on I encounter open tanks of liquid with a strange smell. It is cyanide. 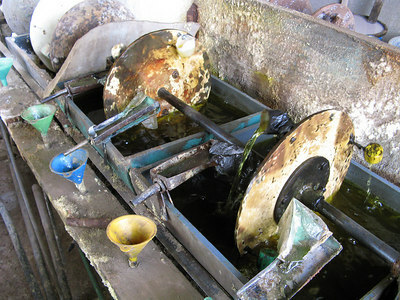 Metal wheels rotate through the tanks, and small thimble-sized cups attached to the sides are transferring liquid cyanide into plastic funnels along one side of the tank. Some of the cups have broken off the wheel; an industrious person has jury-rigged a fix by attaching lids from soda bottles in their place. Open tanks of liquid cyanide. Juan explains that the average life expectancy of the people who work in these facilities is about 45 years of age. They work 12-hour shifts, seven days a week, and the constant exposure to chemicals – particularly cyanide – takes its toll. Why do they do it? Money. A worker in one of these plants can earn 1200 Bolivianos (about $150) per week. By comparison, he says, a teacher may earn around 300 Bolivianos per week. And what happens to all the chemical waste? Well, nothing really. It's mostly dumped into the nearby river, helping Potosi earn a reputation as one of the most polluted cities in the world. The waste eventually makes its way downstream to Paraguay and Brazil. The most shocking thing is that of the roughly 35 processing facilities here, almost none of them are Bolivian-owned. According to Juan, most of the plants are owned by Canadian companies. "These companies, they are really terrible," he laments. "They pollute our rivers and poison our people. But the thing is, they provide something we really need. Jobs. Jobs that pay well. And the government is just as bad, because they don't do anything about the problems." And that's how it's been for about 500 years. Back in the truck, we continue our trip up the slopes of Cerro Rico, passing debris piles left by generations of miners as Juan explains a bit about the mining business. When the mines first opened minerals were selectively extracted based on value. First came silver, and later metals such as tin and zinc. As the mines became less productive over the centuries, miners became less selective about what they brought out. Now they just remove everything and let the processing facilities sort out the minerals. 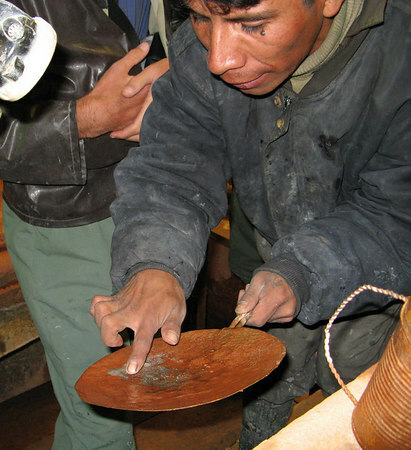 According to Juan, this shift in mining technique has only accelerated deteriorating conditions. "We are literally hollowing out the mountain," he explains. "A while back Cerro Rico was evaluated by a group of American mining engineers. They concluded that within seven years the entire mountain had the potential to collapse on itself. That was eleven years ago. Hopefully it won't happen today." Juan tells me that about 50 years ago miners began organizing into cooperatives in an effort to benefit more directly from their own labor. On average, these cooperatives have about 300 members, and only by working as a 'helper' for many years can one gain membership. 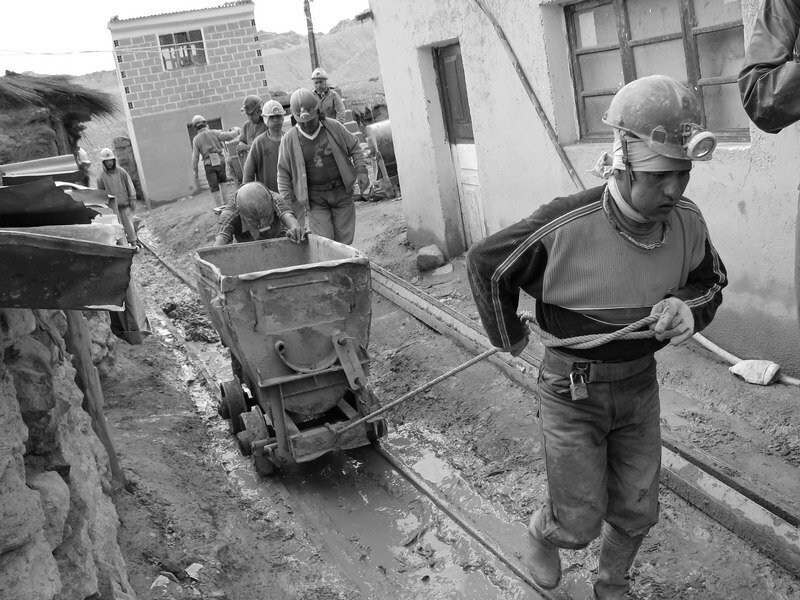 There are hundreds of active mines under Cerro Rico, each operated by a different cooperative. 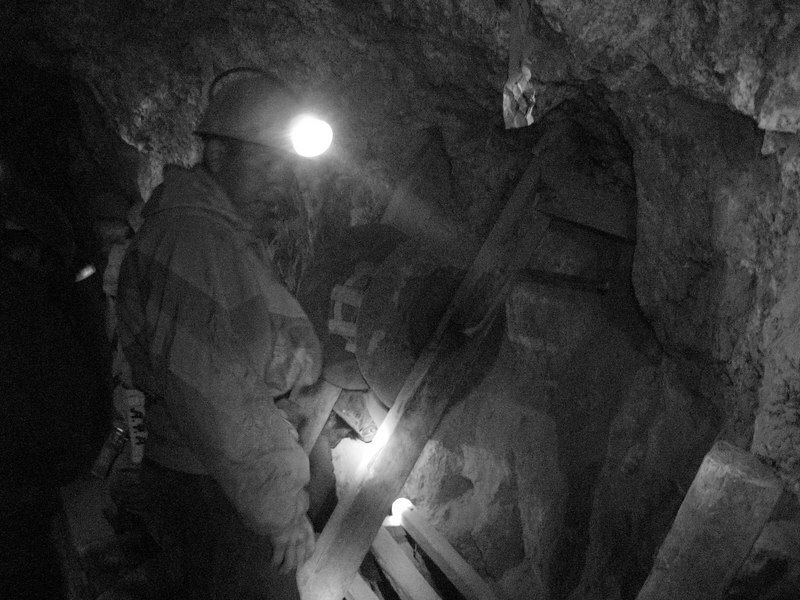 We reach the entrance to the Candelaria Mine, one of the hundreds of mines currently operating underneath Cerro Rico. 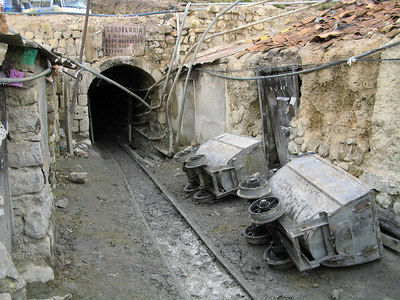 The entrance is littered with debris and a couple of ore carts lie on their sides; metal tracks half-buried in the mud extend from the low tunnel entrance. Feeling a last-second twinge of fear, I ask Juan how carefully the mine has been constructed. His response is anything but reassuring. Upon first entering the mine it doesn't seem so bad after all. A string of incandescent lights extends down the tunnel, and plastic pipes run along one wall. About every ten meters there is an audible hiss coming from the pipes where fresh air is delivered from the outside world. I briefly have to remind myself that this is not a Disneyland tour, but one of the most dangerous mines in the world. "Don't touch any of the wires. You'll get electrocuted," Juan says matter-of-factly. Any illusion that this trip will be easy disappears about 100 meters into the shaft. The lights disappear, the tunnel roof lowers, and my hard hat is the only thing that keeps me from injuring my head on the rock above. Finding myself in a cloud of grey dust I realize that my mask is still around my neck; I quickly pull it over my face, wondering if I have already inhaled something toxic. As we descend into the Earth the temperature rises to the point that I am sweating head to toe, rivulets of grey dust running down my cheeks. Several times we arrive at junctions with jagged tunnels heading off in every direction. This is a real-life maze, and a deadly one if you don't know your way around. Fortunately, Juan does. After descending a shaft lined with what appears to be hundred year-old lumber, Juan calls for a rest. 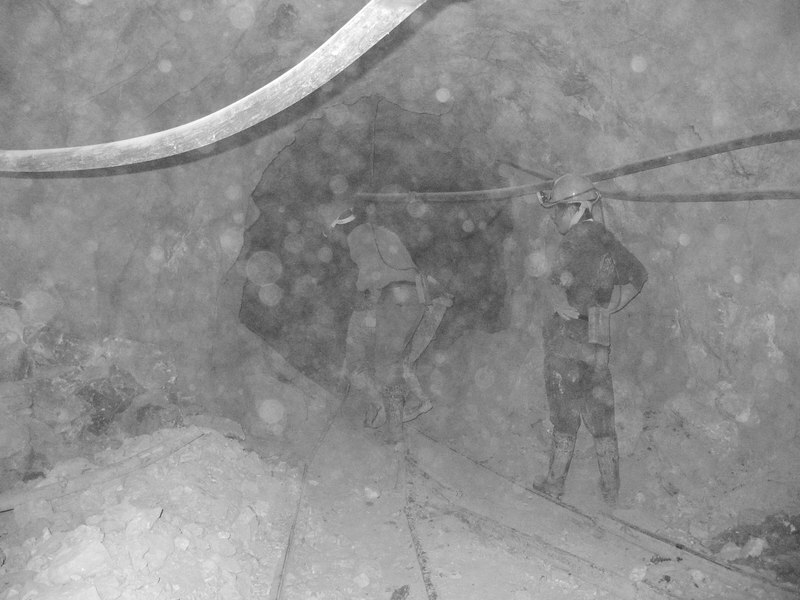 We flatten ourselves against the side of the tunnel as two miners pass, pushing a cart full of equipment. After waiting a few moments, Juan continues his story. "Today, there are about 12,000 people working in the mines; about 2,000 of these are children, often as young as ten years old. Most of them will die very young. Some will last ten years, a few fifteen. 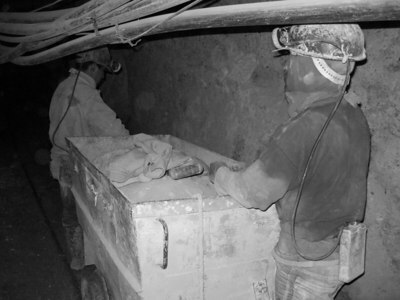 Eventually, if they don't die in an accident, they will die of silicosis – respiratory problems resulting from inhaling particles of silica dust." I have seen the children. Struggling through the tunnels it is impossible not to notice them; they seem terribly out of place. Like the adults, they wear no masks and breathe the fine dust into their lungs. They have already begun the process of killing themselves. Most will never see their 30th birthday. "The children work here instead of going to school because they can earn money. Sometimes 50 Bolivianos (about US$6) per day. That's a lot of money in Bolivia, especially when you're ten years old." They will pay with their lives. As if by some unspoken plan we turn off our lights and just sit, listening to the silence of the mine. Hundreds of feet underground, with no light, it is the blackest black I have ever seen. Even in the darkest night there is some light. Not here. Passing groups of dusty miners, we continue our descent. There is no machinery, no automation here. Every ounce of stone that makes it to the surface is moved by brute force in a cart or on somebody's back. As a result, even young men look old after a short time in the mines. We have descended several levels into the mine when we reach Tío. In Spanish, Tío literally means uncle. But down here, Tío is the god of the underworld. The Devil. When the miners are above ground they worship God. When they are below ground, they pay homage to Tío, asking for his protection while intruding into his realm. Life-size statues of Tío, probably thousands of them, are scattered about the mines under Cerro Rico. They are surrounded by offerings left by miners in hopes of bringing good karma. The statue we encounter is covered with party ribbons and confetti, a testament to the recently concluded celebration of Carnival. In addition there are dried alpaca fetuses, bags of coca leaves, and bottles of the 96% pure cane alcohol preferred by the miners. According to Juan it is tradition for miners to gather near Tío at the end of the week to give offerings, ask for protection, and to drink the 96% pure alcohol – admittedly to dull the senses after a week of work. Picking up a bottle of pure alcohol that somebody has left, Juan sprinkles a bit on the ground at Tío's feet as an offering, then takes a swig. He passes the bottle to me. As I swallow the burning liquid my eyes feel like they're about to pop out of my head; I do my best to look unruffled as Juan continues. "I'm a bit worried," he says, looking at Tío. "In the old days people had a lot of respect for these traditions. They took them seriously. I think the young people now just use it as an excuse to drink. It's not good." I ask if it's possible that years of drinking pure alcohol could be as responsible for the early deaths of miners as breathing toxic dust. "It's probably a combination of the two," he admits. Continuing our subterranean trek we pass through shafts so low that I am crawling on my stomach, clawing my way over what seem to be centuries-old boards, abandoned rails, and climbing near vertical shafts in dust so thick that I can't see more than a meter in front of me. In the maze of the mine I am completely lost. Without Juan to guide me I would never reach the surface. After a few hours my mask has become so choked with dust that I briefly pull it from my face in an effort to take a full breath. Even here underground we are over 4000m high and the air is thin. I try to pretend that the cloud of dust surrounding me is not there, and I begin to understand why the miners don't bother with masks. At some point it's easier to resign yourself to the inevitable than to struggle endlessly for breath. After what seems like an eternity I feel a light breeze coming from one of the shafts. Minutes later it becomes a pinprick of light – literally the light at the end of the tunnel. I suddenly appreciate that saying like never before in my life. Emerging into sunlight I tear the mask from my face and breathe clean, cold mountain air. I am covered head to toe in toxic grey dust mixed with my own sweat. Fresh air never felt so good. 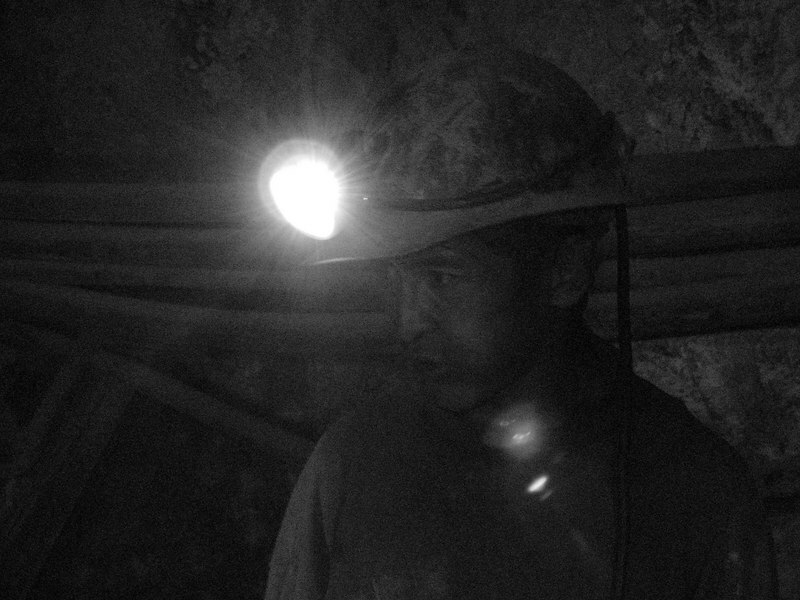 As I stand on the slopes of Cerro Rico, I can't help looking back at the entrance to the mine and thinking about the hundreds of men – and children – still at work in there. Unlike me, they don't get to go in for a day, then leave forever. They live subterranean lives, performing backbreaking labor, with the almost-certain promise of early death as payback. It's the most sobering moment of my South American travels.